One of the biggest insights from this year’s findings is that it is those brands that have the skill, and the will, to engage with individuals on a one-to-one basis that stand out. By creating this personal engagement, these brands benefit from a ripple effect into the rest of the community, which is strengthened and invigorated as a result. The brands that are doing this most actively typically scored highly against our Facebook observable markers of ‘Fan post:Brand post ratio’ and ‘Fan posts interacted with by brand’. On Twitter, ‘Mentions of third party @accounts by @brand’ and ‘Timeliness of response’ were key. An analysis of patterns around these markers also indicated some interesting differences between approaches to community management in different sectors. While Entertainment brands can create significant reaction to content that they post on social platforms, and have high percentages of fan generated content, the markers showed that they are less likely to respond to fans on Facebook, and on average are slow to respond on Twitter. Conversely, FMCG and Travel & Leisure brands are the most prolific at acknowledging fans on Facebook, while Media, Travel & Leisure and Services brands are amongst the fastest responders on Twitter. While the report card for Facebook makes for encouraging reading, the data shows that brands could be making more of Twitter. Looking at the brands in the 100 as a whole, the fact that Twitter demands timeliness appears to have been absorbed (see diagram page 20). 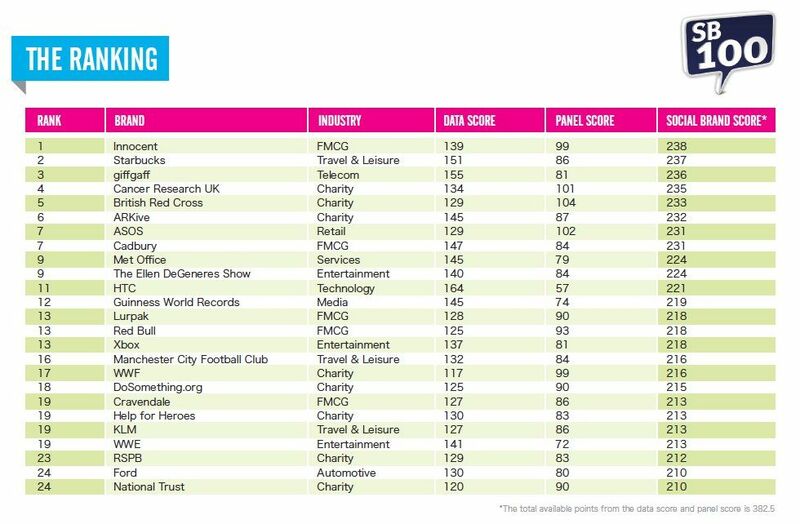 The top 50 brands for the ‘Timeliness of response’ marker on Twitter scored over 75% of available points, and even the lower quartile were at nearly 50% of available marks. Brands that have set up Twitter with a specific customer service purpose were well represented amongst the fastest responding brands. Media and Travel & Leisure brands featured heavily in the list of those brands doing this well. is the best indicator of a brand’s willingness to employ effective active listening on Twitter, and to use the platform for conversation over broadcasting. On this evidence there is greater potential to be realised here. Technology and Travel & Leisure brands are doing this best at present.